Brady Byrum – Who/What Is He Really? – The Rumors! – Kent Hovind v. Robert Baty – The Great Debates! Home→Brady Byrum – Who/What Is He Really? – The Rumors! Sometimes, when you are trying to engage in the discussion of important public issues on-line and cover stories as they might continue to develop, people tell you things. 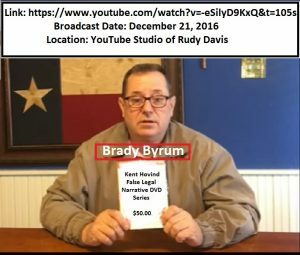 So it is has been with me and Brady Byrum now that Brady’s celebrity has grown as a result of Kent Hovind’s handler Ernie Land announcing (and now maybe wishing he had never said it) that Brady Byrum was the secret sovcit operative meddling in the “Baby Holm” case out of Cleburne County, AL. As reflected in various other articles on this website, Brady has long been associated with Kent Hovind, the featured subject of this website, and the promotion of Kent’s false legal narrative, as I like to characterize it (which I believe to be a correct characterization). So, it happens that I have been told some things about Brady Byrum today and they are worthy of consideration and further development as the story might continue. As I have said repeatedly, there are numerous analogies that can be made between the Kent Hovind Story and the Baby Holm Story. It now seems the analogies run even deeper than I previously suspected. I cannot independently confirm the following claims and am not able to reveal my source(s). Maybe that will all come later; maybe not. Those in the know are welcome to add to the discussion via the comments section below; whether they propose to corroborate the claims or rebut them. Brady Byrum may have a long association with the sovereign citizen organization known as the “Little Shell Pembina Band”. So much so that he may have been adopted into the tribe and had is wife and/or children similarly adopted. After a long marriage and a number of children, Brady and his wife were divorced in recent years. Brady’s wife and children have, as with the Hovind family, apparently estranged themselves from Brady as he, like Kent, has continued with his anti-government, sovereign citizen lifestyle and activities. Brady’s children apparently grew up with identity problems (i.e., no Social Security Number, drivers’ license, etc.) which may have caused them considerable trouble as they sought to lead normal lives and pursue normal interests in today’s modern society. Brady’s wife may have had to explain to the kids from time to time that their daddy was not home because he was on a business trip (i.e., to some jail/prison when his activities caught up to him). The family may not now know Brady’s whereabouts as he seems to operate secretly and may, even now, be being sought because of some outstanding warrant related to some misbehavior on his part. DOES ANYONE KNOW WHERE BRADY BYRUM IS? Is the trouble Brady Byrum may have gotten himself into one of the reasons that he and Kent Hovind publicly split as far as promoting the “Kent Hovind Is Innocent DVD Series” and scheme? Are they now resolved to work together in secret? As I have stated repeatedly, and I think reasonably demonstrated, Brady Byrum, in conjunction with the parents who were willing participants, is the reason more productive action was not taken earlier to resolve the Baby Holm custody issue. Are the Baby Holm parents victims? Given my involvement with them and their case, I would currently label them as co-conspirators along with Brady Byrum. I welcome the parents efforts to convince me otherwise, but to date they have been very active in convincing me that they share Brady’s theology about such things and knew what they were getting into when they accepted, or enlisted the services of Brady Byrum. When I asked the parents of Baby Holm about Brady Byrum’s involvement in their case, they deleted my comment from their FaceBook page, blocked me, and otherwise have been unwilling to discuss it openly and honestly; as has their #1 promoter Jonathan Payton. We will see where it goes from here.